description: The Happy Time Toy Factory is a highly successful manufacturer of toy robots, and yet the owner, Mr. Anderson, is riddled with guilt. He calls his assistant Jefferson Stevens into his office to confess his misdeeds: not only is the factory built on an ancient American Indian burial ground, but Mr. Anderson has been using the remains of the American Indians in the toys. Anderson, however, has no intention of righting these wrongs. Mr. Stevens is appalled at the potential for evil in these robots, and immediately quits his job. Stevens goes home to discover to his horror that his wife and daughter have been murdered by the toys his daughter has been collecting for Toys for Tots. He flees as the toy robots reek havoc all over the town, killing and/or destroying whatever comes in their paths. In Sheriff Tim MacKenzie's office, the sheriff's secretary Claire informs them that they have lost the fifteenth patrol car to the robots that day, and the sheriff and his deputy Cleveland prepare to go out to face the robots as well when Stevens enters. 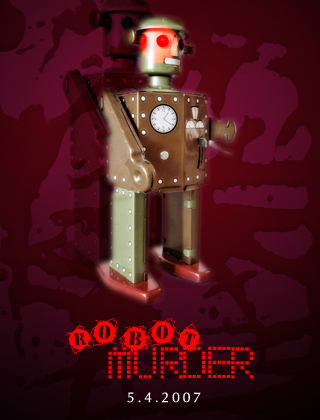 As he relays what he knows to the sheriff, robots begin to creep into the room, killing Deputy Cleveland. Claire, meanwhile, inadvertently discovers that the robots are negatively effective by excessive blunt force. This allows the sheriff to utilize his minor league baseball training, and he efficiently takes out hundreds of robots. The three surviving humans hop into a patrol car and speed in the direction of the toy factory to put a stop to all this. At the factory, Anderson lounges in his office, being fed grapes by Pleasure Bots, who convince him to make more robots. Meanwhile, on the factory line, robots are building more robots despite their restlessness and general frustration with their jobs. Sheriff MacKenzie, Stevens, and Claire see no way to get into the factory through all the robots, so the sheriff takes out three robots and they use the parts to disguise themselves and assimilate. They make their way to Anderson's office, where he is leading the Pleasure Bots in a game of Dance Dance Revolution. Their ruse is quickly discovered, and Anderson orders all the robots to his side, where they form Megabot. The sheriff yells for the other two to escape as he takes his bat to Megabot. As they make their way out of the factory, Stevens and Claire are greeted by the sight of Native American spirits rising from the ground. The spirits swarm to Anderson's office, where they overtake Megabot and consequently Anderson. As he is defeated, robots freeze all over the town. Triumphant, Sheriff MacKenzie exits the factory with a Pleasure Bot over his shoulder and rides into the sunset.